Latest Update: Maruti has launched the Ciaz 1.5-litre diesel at Rs 9.97 lakh (ex-showroom Delhi). The new in-house developed diesel engine is available on all variants except base-spec Sigma. Details. Maruti Ciaz price and variants: Prices for the Maruti Ciaz start from Rs 8.19 lakh and go up to Rs 11.37 lakh (ex-showroom Delhi). The Maruti Ciaz is available in four variants: Sigma (base), Delta, Zeta and Alpha (top). 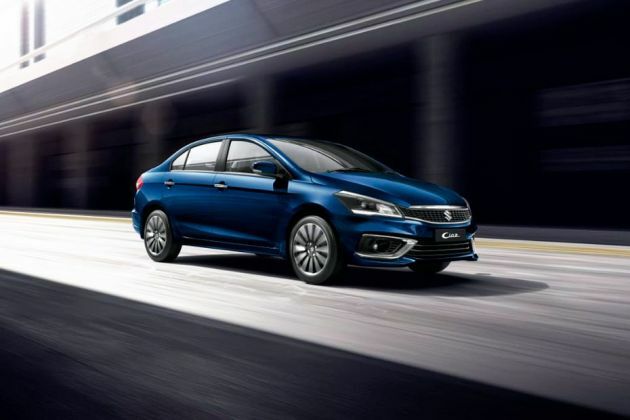 Maruti Ciaz Engine and Mileage: The Maruti Ciaz comes with a new 1.5-litre petrol and diesel engines as well as the existing 1.3-litre diesel motor. The new petrol engine is rated at 105PS/138Nm, whereas the new diesel engine produces 95PS/225Nm. The 1.3-litre diesel produces a familiar 90PS/200Nm. The petrol and 1.3-litre diesel engines are mated to a 5-speed manual, while the 1.5-litre diesel is coupled to a 6-speed manual. The petrol motor also comes with the option of a 4-speed AT. Coupled with a mild-hybrid tech, the Ciaz petrol returns 21.56kmpl (MT) and 20.28kmpl (AT), while the diesel engine has a milrage at 28.09kmpl. The 1.5-litre diesel, on the other hand, is rated at 26.82kmpl. Maruti Ciaz features: The Maruti Ciaz gets auto LED headlamps, LED fog lamps, tail lamps with LED inserts on the outside. There’s even a 7-inch touchscreen infotainment system with Apple CarPlay and Android Auto, auto climate control, passive keyless entry system with push-button and leather upholstery and cruise control, among others on the inside. For safety, the Ciaz gets dual front airbags, ABS with EBD and ISOFIX child seat anchors, speed alert system (SAS) and seatbelt reminder (SBR) as standard across the range. Maruti Ciaz Rivals: The Maruti Ciaz goes up against the likes of the Honda City, Hyundai Verna, Toyota Yaris, Skoda Rapid and Volkswagen Vento.